Israeli soldiers abducted, late on Saturday at night and on Sunday at dawn, seven Palestinians from several parts of the occupied West Bank, and later released three of them. The army also installed many roadblocks. Media sources in Bethlehem, in the West Bank, said the soldiers invaded the city, and abducted Mo’tasem Mohammad al-‘Arouj, 21, after storming his family’s home and ransacking it. The soldiers also invaded homes in Surif town, west of the southern West Bank city of Hebron, and abducted two Palestinians, identified as Ahmad Taha al-Hoor and Mohammad Sameeh Ghneimat. The soldiers also invaded many neighborhoods in Doura town, south of Hebron, especially the eastern part, before breaking into a blacksmith workshop and searching it. On Saturday at night, the soldiers stopped a Palestinian car at the northern entrance of Madama village, south of the northern West Bank city of Nablus, and abducted four young men, who were in the vehicle. 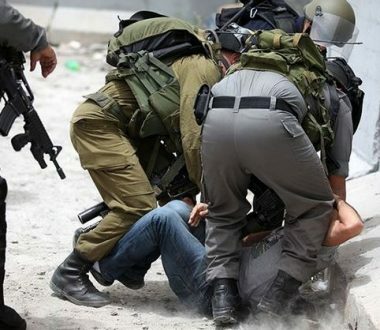 The soldiers interrogated the Palestinians for more than four hours, and later released three of them and took one, identified as Dia’ Fares Qadous, to an unknown destination. Also at night, the soldiers installed a roadblock a ‘Arraba town junction, and one near Be’er al-Basha village, in addition to the main road leading to Arranah village, east of the northern West Bank city of Jenin, before stopping and searching dozens of cars, and interrogated many Palestinians while investigating their ID cards.